Did you know that the dependability of D alkaline batteries depends more on the D cell alkaline batteries distributor than the D battery itself? Plenty of D alkaline batteries look solid on the outside but are inferior quality batteries D on the inside. These D cell alkaline batteries have been improperly stored, are brand name D battery imitations, or have expired. When you buy D alkaline batteries from Medic Batteries , your bulk D cell alkaline batteries are 100% guaranteed. Our D alkaline batteries have been properly stored in a cool, dry warehouse, are made in the USA and are shipped immediately in most cases. 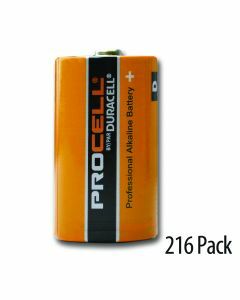 We offer consistently low prices on the D cell alkaline batteries we sell and best of all, when you buy bulk D alkaline batteries from Medic Batteries , you will have access to our superior customer service. For all your battery needs, our friendly customer service experts on D cell alkaline batteries are available to answer your questions. Why buy your batteries anywhere else?